That night, we spent a beautiful night, and it was certainly the most extraordinary one we have ever had so far. 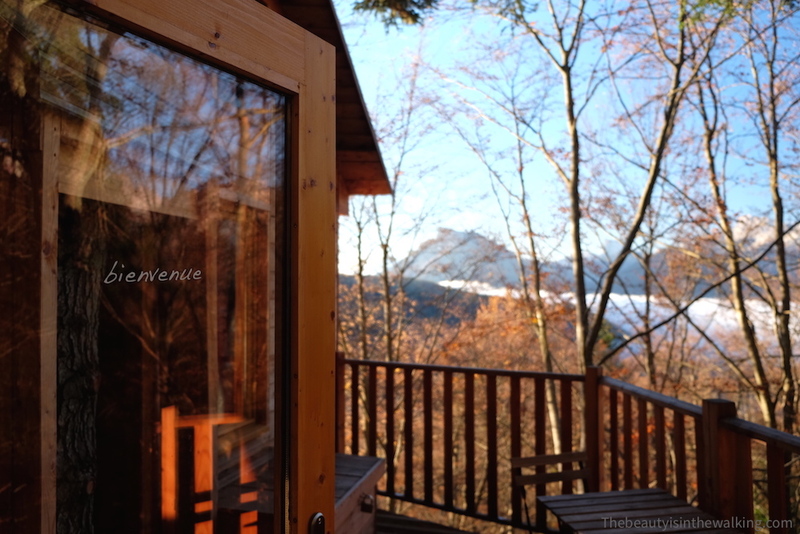 We slept in a lovely tree house fixed on a huge pine tree in the middle of the French Alps – the Vercors Massif to be precise, located at a few dozen kilometres drive from the city of Grenoble. I have to tell you that for my Mother’s 70th birthday, my brother and I decided to surprise her by taking her to spend the night in out of the way place, to fall asleep with the sounds of the forest and wake up to birdsongs in the early morning. What could be better than a tree house? Yeah, but we were dreaming of a cosy, veeeery high tree house with a beautiful view. And we ended up finding our dream tree house: la cabane de bois Mauret (the Tree House of Bois Mauret). The tree house is fully equipped and solar-powered. It has a small kitchen with a gas cooker, a sink and all the crockery and cooking utensils, dry toilets, a stove (for cosy evenings, grrr…), an extra gas heating if you don’t want to start a fire in the stove, a table, stools and a sofa. On the upper floor, the sleeping area offers two double beds under the roof, on each side of the trunk. On the main floor, the sofa can be used as an extra bed. In total, the tree house sleeps five. Located in the tiny resort of the Azelier Pass (1154 m – Municipality of Château-Bernard), at 25 km South from Grenoble (40 minutes’ drive by the most direct route), the tree house is rather hidden in the forest and it takes 10 min to walk up there from the car park. Eating. If you don’t feel like cooking in the evening, you can climb the steep slope nearby to reach the Refuge de la Soldanelle Inn and deserve your meal – a simple homemade menu cooked with fresh local products – in a traditional mountain chalet (Careful! It’s closed until mid-December, but it’ll reopen for the holiday season). And if you’re lucky enough, you’ll even be able to enjoy a beautiful sunset on the valley and surrounding mountains as you walk up to the refuge. There’s also Les Agapes Restaurant, down in the resort, near the toboggan run, that serves tasty home-made cuisine with a stunning view on the two mountains above, Les Deux Soeurs (the Two Sisters) – Agathe and Sophie. ;-) We recommend this address as well, but it’s better to go there for lunch with a beautiful weather and you can enjoy your meal on the terrace. A unique experience! Hiking. There’re many hikes of all levels around with gorgeous views on the Eastern Balcony. Information and maps are available in the tree house to borrow. Voilà! Now, we’re waiting for the second tree house to be completed. It’s currently under construction a little further away and it has been designed on two trees to be able to welcome a larger group or family. Ideal for a couple or a family, even with young kids (tested and approved with a 5-year-old child; it’s very safe). Tell us about your stay if you decide to go there! That was an experience for you all to treasure and such a great surprise for Dany. She would have loved it! May be next time I’m in France……… The view together with such food looks amazing. What fun! Yes, that was a wonderful moment together and everybody was so excited to spend the night in such a lovely tree house.